i'm back home for the weekend for project: surprise the parentals for mother's day weekend. it was a success i think, but the thought of me secretly coming home did cross her mind. mother's intuition? gracefulleats started in college, but its roots actually started when i was elementary school. I remember I used to follow my mom around in the kitchen trying to help and always asking a million questions. I was basically her sous chef, whether she liked it or not. I stirred many pots, chopped many vegetables, and helped stir fry many things. I can't cook for the life of me, but I've definitely learned to love being in the kitchen and serve others through food from my mama. My mom is a godly and sweet woman. She's taught me so much on how to love and care for others and to wholeheartedly serve and trust in the Lord. I strive to be like her, and maybe one day I'll be a skilled chef like she is! I'll stick to the baked goods for now, though - but i'm really hoping to be the exemplary woman she is today. My mom's favorite dessert is a cheesecake, but I just posted about that a couple weeks ago, so cream scones will be on the menu today! Scones aren't the type of pastries I would go out of the way to buy. most of the ones I find in bakeries or in stores are either too dry, not flaky enough, too sweet, too biscuit-like, or over-glazed. I like my scones slightly crispy on the outside, soft and moist on the inside, with a little bit of sweetness from the mix-ins and either a light, light glaze or a light sugar topping. And these things work and fulfill every require from that list. 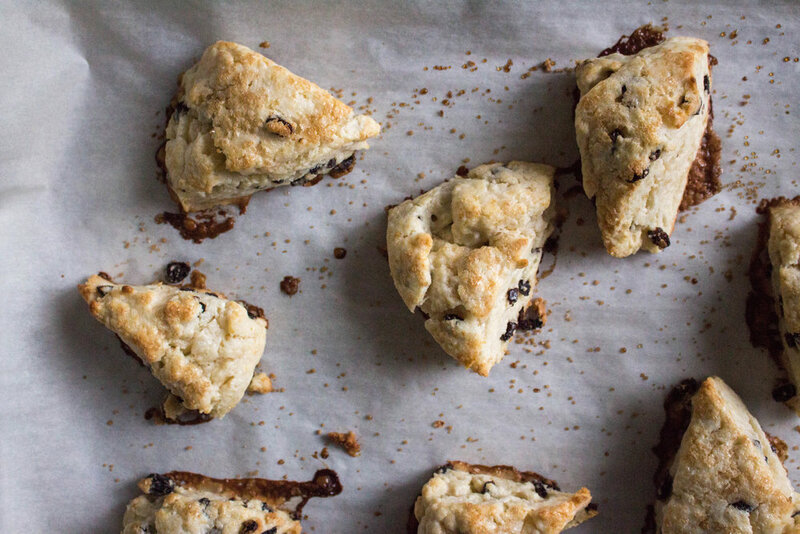 So, enjoy these slightly-crispy, soft-on-the-inside, flaky and sweet-but-not-too-sweet scones. they are creamy and absolutely, definitely dreamy. baker's notes: i like making these with currants or blueberries, or some mix, but try these with chopped dried cranberries, too. 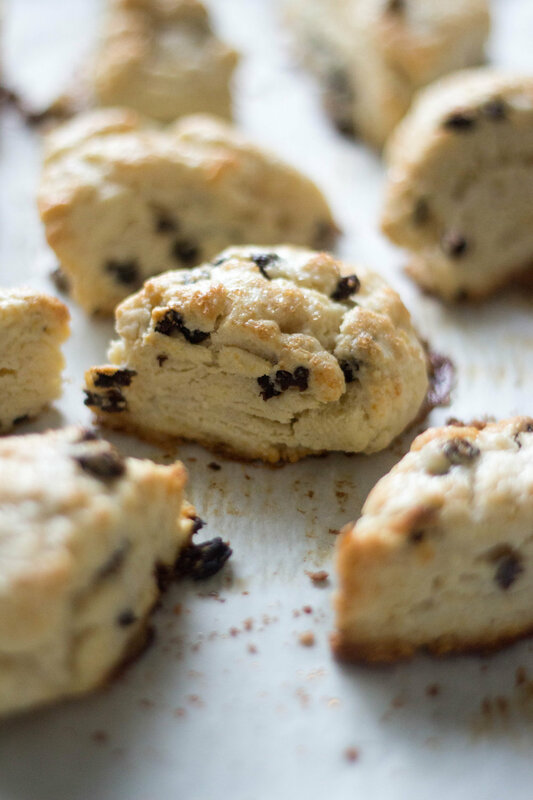 freezing - these scones freeze well. you can make the scones, brush with cream, sprinkle with raw sugar, and freeze, or you can make the scones and freeze and top with cream and raw sugar later. either option works for me, and i prefer the first option since i don't always have cream on hand but seem to always want scones. bake frozen scones at 425 f, and start checking for golden brown tops after 12 minutes. in a large bowl, whisk together the flour, baking powder, granulated sugar, and salt. using a pastry blender or two knives, quickly cut the butter into the flour mixture (you want the butter to stay as cold as possible) until the mixture resembles coarse meal, with a few butter lumps the size of peas. stir in the currants/dried blueberries. stir in the heavy cream into the mixture until a dough ball beings to form. lightly flour a work surface. transfer the dough onto the work surface, including all the leftover flour bits at the bottom of the bowl. knead the dough (literally 10 seconds) into a rough, sticky ball. don't overwork the dough. brush each scone with a little bit of cream, and sprinkle the tops with turbinado sugar. at this point, if your kitchen is particularly warm, i'd recommend chilling the scones in the refrigerator for 15 minutes or so before baking. you want cold butter in the scones when you bake to produce the flaky layers! bake for 12-15 minutes, or until the tops of the scones are light brown. serve warm or at room temp. enjoy!! !